“Matrixome” is a neologism that combines the word “matrix,” from extracellular matrix, and the suffix “-ome,” indicating the mass. This new matrixome concept refers to the entirety of molecules (proteins) that constitute an extracellular matrix. The basic unit that creates our bodies is cells. The human body is made up of 100 trillion cells, and ECM. The extracellular matrix is indispensable for these cells to assemble to form tissues and organs and to function correctly. 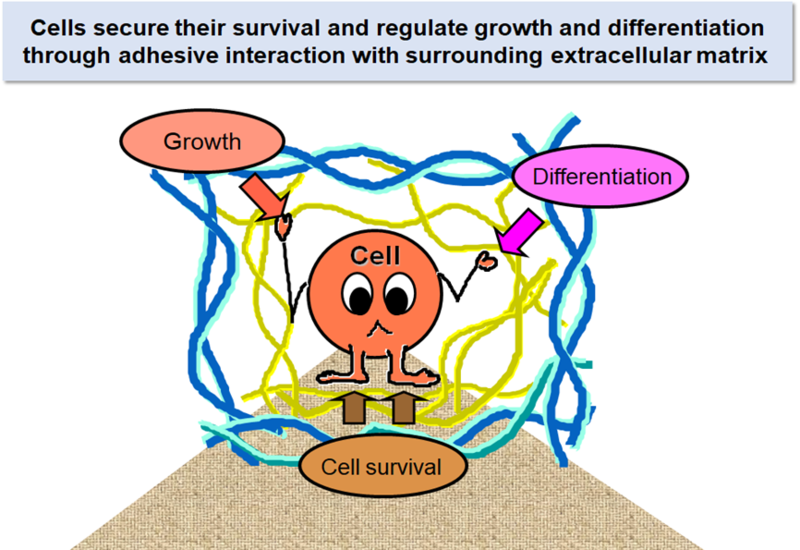 The extracellular matrix, which exists around cells, is fibrillar or sheet-like in structure. Although it was once thought of merely as filler in the interstitial space, it has been recognized that the behavior and fate of cells are regulated by their interactions with the surrounding extracellular environment. Extracellular matrix is a crucial environmental factor that control cells. The extracellular matrix is made up of 300 or more kinds of protein. 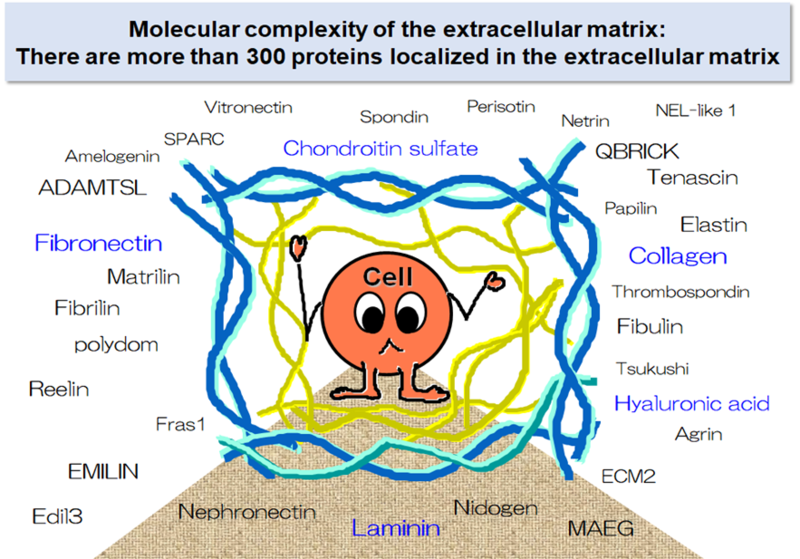 The combination of proteins that make up the extracellular matrix is different for each cell. Just as we arrange the environment around us to our taste, cells need the environment – the extracellular matrix – that suits their functions. In order for cells to maintain their functions in a stable manner and regulate their proliferation and differentiation orderly, the extracellular matrix, which has the molecular composition optimized for each cell, is essential. Regenerative medicine is translational research in tissue engineering and molecular biology that deals with the "process of replacing, engineering or regenerating human cells, tissues or organs to restore or establish normal function". Regenerative medicine is based on in vitro cell culture and its fundamental practices which include culture techniques that maintain and amplify tissue stem cells and pluripotent stem cells and differentiation induction techniques that efficiently generate target cells from pluripotent stem cells. 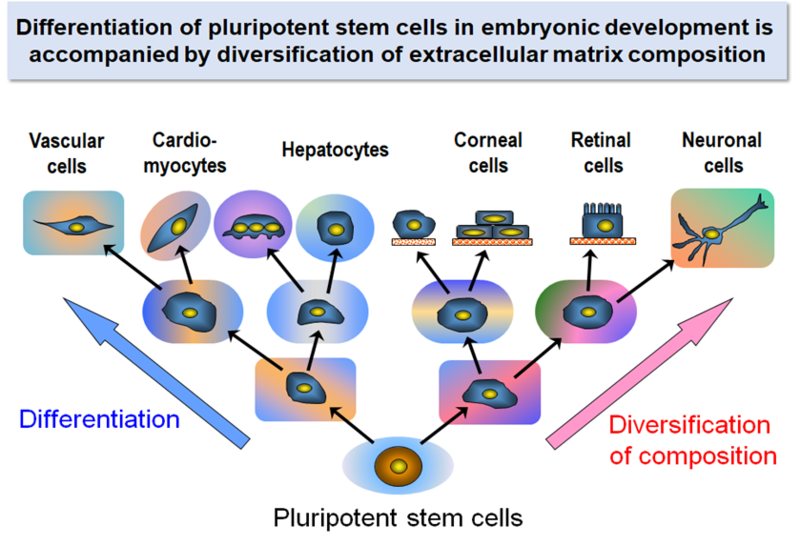 Culturing pluripotent stem cells such as tissue stem cells, ES cells, and iPS cells is not a simple task and the type of culture medium and culture substrate chosen influence the outcome of the culture. Better understanding of the composition of the extracellular matrix that surrounds cells in vivo will lead to development of designer substrates for stable maintenance and/or efficient expansion of cells including embryonic and tissue stem cells. Through innovation in cell culture techniques, we can contribute to realization of regenerative medicine and advancement in stem cell biology and medicine.